Couldn't quite believe this when I first read it, but thinking about it more it makes perfect sense. 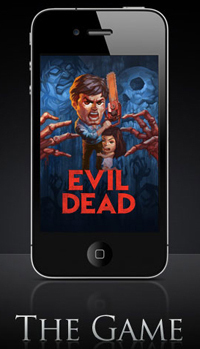 Yes, Sam Raimi and Rob Tapert's Evil Dead is coming to the iPad and iPhone. The Evil Dead app, which will be available for $2.99 for the iPhone and $4.99 for the iPad (once Apple approves it in the coming weeks), is an action-heavy 3D shooter game that allows players to take control of Bruce Campbell's character Ash to lead his group of friends to safety while fighting off evil zombies." Sam, Bruce and I have always been interested in finding ways to bring our 1980's Evil Dead into the digital age," said Tapert. "And taking this first step with Trigger has been a great experience." The trailer, it has to be said, makes us very, very much want to play this game. Give me some sugar baby.